By far the most common ungulate — a technical term roughly meaning “hoofed animal”, though not all hoofed animals are ungulates — at the Ucross ranch is the white-tailed deer (Latin name: Odocoileus virginianus). There are actually a variety of white-tail subspecies populations that stretch from the eastern coasts of North America all the way to the northern parts of South America. White-tail are not the only hoofed wild animals roaming the ranch, however. Exploring the hills of the open range, one will often encounter Pronghorn Antelope (pictured below; Latin name: Antilocapra americana). With the characteristic shape of their horns and the white coloration on their bellies and backside, they’re fairly easily distinguished from common white-tailed deer. 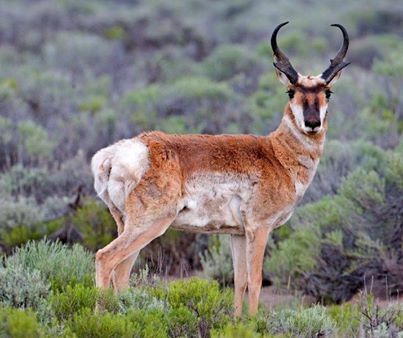 Charlie and Devin came across one running through the sagebrush just the other day and recognized it immediately as an antelope — not because of its horns or coloration, but because of its speed. Pronghorns are actually considered the fastest land animals in the western hemisphere, with top speeds during sprints around 55 mph / 88.5 km/h — quick enough to give an African cheetah a run for its money!